Very cozy and historic accommodations. Everything was very clean and neat inside the room, with clean towels, and extra warm blankets provided. It is located 8-10 minute walk from the Old Town which makes it an ideal place to spend the night after exploring the historic city. The price is fairly reasonable and breakfast can be provided for an extra fee (cheaper than eating in the town). Only suggestion I might have is to upgrade the WiFi as it was unusable due to poor connection and disconnecting. The price you found is 33% lower than this hotel's average rate of $126/night. The appeal to be was the secure courtyard parking for the motorbike, but there was much more to Casa Baciu having stayed there. The large wooden door swung open soon after I used the intercom and I received a friendly welcome. The bike safely parked I was able to take the 5 minute walk to the old town squares and the Bridge of Liars where there are plenty of places to eat. There is a grocery shop a few steps from Casa Baciu. The large room had basic but comfortable furniture and the en-suite bathroom was excellent. It was quiet despite the central location. Only the electrical storm in the night woke me and then it was pleasant to sit under cover in the courtyard. Breakfast was served in the small dining room with charming serve once more. Eggs were cooked to order and there was salad,cheese, bread, meats, jams etc. Coffee was freely available and I sat in the courtyard with my second cup. The signage for the hotel is easy to see but sat nav is an advantage in these old medieval cobbled streets. Good levels of service, great position and good value. 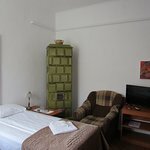 I spent two nights at Casa Baciu last July. The hotel is conveniently located within easy walking distance of both the train station and the old city. The room I was in got rather warm without air conditioning, but was otherwise very comfortable. The bathroom had some signs of wear, but did have updated fixtures. I did not have the opportunity to try the breakfast because of my schedule, but it was available every morning. Overall I had a good stay at Casa Baciu. It is a good hotel for a budget price. A very helpful staff and very welcoming. We had breakfast even if we were the only two guests there having it at the venue. It was big and made especially for us. We also had extra coffee because we felt like drinking more. Also, on the day of our arrival, because we got there earlier, we were invited to wait for our room over a cup of coffee in the backyard. Typical Siebenbürger house in typical street in front of the old town. Short distance to the center (about 5-7 minute walk); some restaurants, mini-market and bank office along the way. Courtyard parking; room (simple but spacious suite on the first floor) quietly located facing the nice courtyard (unless noisy young people from a neighbouring house disturb). Very clean. Simple but sufficient breakfast (cereal, yogurt, sausage, cheese, vegetables, egg on order, water). Coffee in the Thermos on the second day was cold.